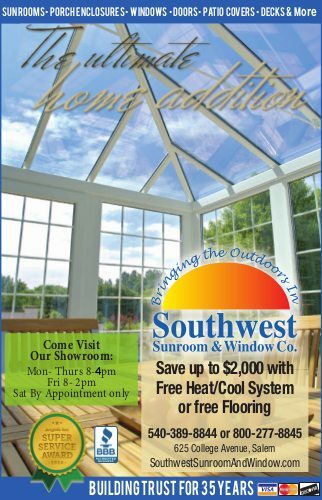 Southwest Sunroom & Window Co. is a leading Class A sunroom contractor serving Salem, Roanoke, Lynchburg, Vinton, Smith Mountain Lake and surrounding New River Valley areas. Our professional team has the necessary industry-experience and skills to handle all of your sunroom needs. From restoring old, worn-out spaces to building new, beautiful rooms, our professional team will make sure your new sunroom will perfectly meet your desired style. We specialize in building custom sunrooms that will meet the unique style and tastes of our customers. Our sunrooms are professionally engineered for your piece of mind, they meet and exceed local building codes in the Salem area. Listed below are a few examples of typical projects, but we encourage you to contact our professional team with questions or ideas about a future project that you have in mind.